Since a dividend distribution results in share value declining by the dividend amount (in most cases as you will soon see), it would be unfair to a call buyer to own a specific strike and now learn that share value will drop by $0.45 prior to contract expiration. As a result, the Options Clearing Corporation (OCC) adjusts option contracts such that buyers and sellers of calls and puts are “made whole” The result is strike prices dropping by the dividend amount for all call contracts currently in place, $0.45 in this case. This would lead us to believe that all $95.00 call strikes would be adjusted to $94.55 on the ex-dividend date. 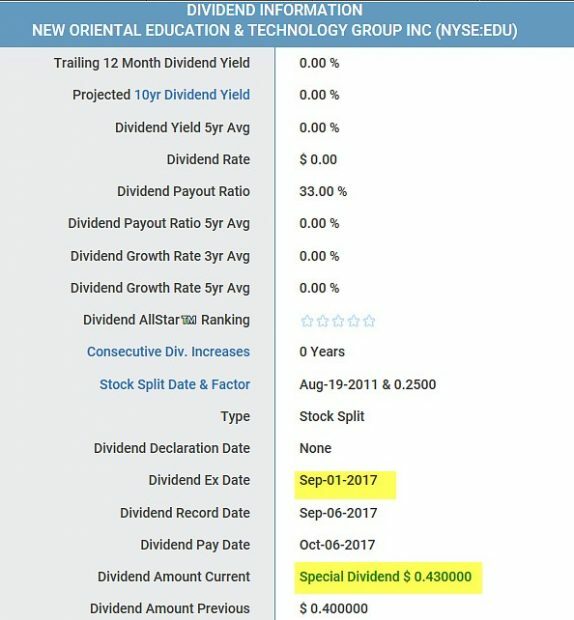 The first item that stands out is that the dividend is listed at $0.43, not $0.45. When ADRs distribute dividends, there is a bank intermediary that takes a transaction commission, $0.02 in this case. This results in a dividend distribution of $0.43 and option contracts will be adjusted by this latter number. All contracts that were in place at the time of the announcement, even those expiring after the ex-date contract month are adjusted. The current $94.57 strike price was originally a $95.00 strike price prior to the special 1-time cash dividend announcement. When unusual strike prices are listed in an option chain, it is usually the result of a corporate event that changes the parameters of the stock value. The Options Clearing Corporation will step in and make the necessary contract adjustments to make buyers and sellers of calls and puts “whole” American depository receipts will include the added adjustment for bank transaction costs. newbook5: $5.00 off the price of the new book ($27.00 – $5.00 = $22.00). The book will cost $35.00 when available on Amazon.com. The BCI team will be adding an additional screen to the stock selection process to replace the Scouter rating screen. The new screen will include an evaluation of the consensus analyst recommendations for each security that has passed all other BCI screens. Our team has been testing the new screen and we have concluded that this change will represent an enhancement to the quality of the products we provide to our members. More details to follow. BCI: Using an equal number of in-the-money and out-of-the-money strikes. Tariffs a concern. The 6-month charts point to a neutral tone. In the past six months, the S&P 500 was up 1% while the VIX (16.00) moved up by 40%. Well, speaking only for me, I am glad to see June over with ending on a decent day. July 4th week has reasonably good seasonality on US indexes. Plus a jobs report Friday so maybe some of the give backs in stocks can be recouped? It was interesting to read HOG and GM say the tariff policies will move some US jobs overseas. Little doubt other companies will do the same thing. That was not hard to see coming. It takes two sides to have a war and other countries are not just going to sit there and take it. They will bite back. Meanwhile companies are not necessarily in the business of creating jobs. They are in the business of creating profits for shareholders. When government policies make that difficult you go somewhere else. Nothing complicated about it:)! This week’s Weekly Stock Screen And Watch List has been uploaded to The Blue Collar Investor Premium Member site and is available for download in the “Reports” section. Look for the report dated 06/29/18. One last point. Next week’s report may be coming out late. I am participating in the NJ Rugged Maniac race on Saturday, July 7th. Hopefully, the report will be out on time. However, it may be out early Monday morning depending on the shape I’m in. Share price then moves up, bringing up the value of the $50.00 call which is then re-sold at $1.00. In the multiple tab of the Ellman Calculator, we can update option premium from $2.00 to $1.60 to $1.00 (red-circled area in the screenshot below). This will dictate the results on the option side of the trade assuming no other exit strategies are employed. The brown field shows option returns moving from 4.2% to 3.3% to 5.4%. The yellow field shows the upside potential remains at 4.2% throughout the trade as long as the same strike is kept in place. The stock side will be determined by the price of the stock at expiration. The screenshot below shows the trade adjustments on different lines. In real-life trading we can simply adjust the one line in the spreadsheet. I am guessing sto at ask price is correct. Good question because this is an area all option traders should understand before entering into an option trade. The difference between the “bid” price and the “ask” price is known as the “spread” That’s the amount the market-makers will profit from when executing these trades…they are buying low and selling high…them, not us! We sell at the “bid”, the lower price and buy at the “ask”, the higher price. That said, when the spread is $0.15 or more, we can take advantage of the “Show or Fill Rule” to get a higher “bid” price or a lower “ask” price. This regulation was put in place for retail investors like us and we should take advantage of it whenever the opportunities arise. In these scenarios, we enter a limit order between the “bid” and :ask” prices in an effort to pay less or sell at a higher price. As we are writing cc and csp. Am i correct? I want to explain further what the Bid and Ask prices since your response, as I understood it, is not strictly correct. The Bid and Ask price are the best prices a money maker or some entity in the market (not you) is willing to Buy or Sell, respectively, from you. The Bid is the highest price some else is willing to pay to you for a specific security you are selling. The Ask is the lowest price some else is willing to offer to you for a specific security you are trying to buy. It looks confusing and the following will explain in detail which price you should look at. Getting specific with options, if you are looking to Sell to Open an option (Covered call entry option, for example) or Sell to Close an option (does not apply to a covered call option),you look at the Bid price first. The key word is Sell, whether you opening or closing is irrelevant. If you place your order to sell at the Bid price, you will fill that order immediately since that is the highest bidder willing to pay that price at that point in time. If you think that price is too low for you, you can “play the spread” by placing a limit order for a higher selling price between the Bid and Ask published prices. Likewise, if you are looking to Buy to Close an option (Covered call exit option, for example) or Buy to Open an option (does not apply to a covered call option), you look at the Ask price first. The key word is Buy, whether you opening or closing is irrelevant. If you place your order to buy at the ask price, you will fill that order immediately since that is the lowest Ask or offer price some is willing to sell to you at that point in time. If you think that price is too high and want to buy at a lower price, you can “play the spread” by placing a limit order for a lower buying price between the Bid and Ask published prices. Very good question. 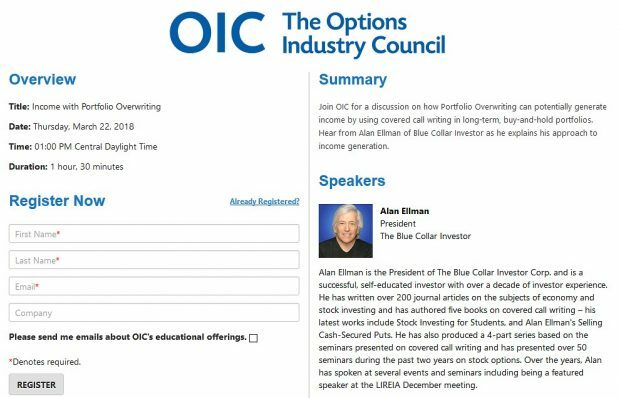 Alan answered you by using the Ellman Calculator to adjust the Option Premium in the Ellman Calculator to indicate your Return if Buy Back the option on a gap down, wait for gap up, then Sell the option again, assuming the stock was at the initial stock price and Strike sold was the same. I have been using Alan’s methodology for 27 months and have modified, improved, made more efficient how I document each investments return during a cycle, expiration, roll out, roll down etc. To understand the calculations for the Return, I initially used Alan’s P&L-Spreadsheet 2015 available in the Member download area. This spreadsheet is very instructive in understanding how a Trade’s return can be calculated, understood, and documented for Covered Calls and CSPuts. I improved the spreadsheet in many ways some issues and to keep track of Account Value as well and other nice features. But I eventually concluded it was a time consuming and inefficient process to use on a daily or weekly basis. I evolved my procedures and now use a form which I call a Trade Log (described below) to manually keep track of each trade which keeps tracks concisely the current Cash position in an account and which I can easily calculate the return when needed at any time there is cash flow (Entry, Gap up/down, Unwind, Dividend receipts, closing positions etc.). For the Return calculation, I do this by keeping track basically of the breakeven point (BEP) and the Return Cost Basis (RCB) of a position. The Ellman Calculator can also calculate some of the returns (What Now Tab (Exp. Friday), Unwind Tab (Gap up) , Multiple Tab (Entry comparisons) at different stages of a trade. The Classic Version of the Complete Encyclopedia that I purchased was extremely helpful in explaining the process and the logic and calculations in the trade analysis portions. This Trade Log form also double checks the brokerages calculations of the current cash available to trade / committed to Open Orders / Reserved Cash. The Trade Log form has the following 4 columns: (1) Date (2) Symbol/ ReservedCash/ Committed to Open Order Balance, (3) Cash Debit/ Cash Credit/ CashBalance (4) Description of Trade. Note: I normally do not keep track of the account value since my broker takes care of that but I show it below to show the account value at a point in time after a trade occurs, which is instructive. When I started with the BCI Methodology, I was not completely sure the effect of a trade on my account value and Cash and it was confusing also because of the Intrinsic Value paid to me on on ITM trade. …………………(4) RCB = 48 BEP = 46.0563 (48.0495 – 1.9932) ; ROO% (48-BEP)/RCB = 4.05% (This show the effect of the commission. Without commission = 4.17% – Ellman Calculator rounds it to 4.2%) Upside potential: ((50 / 48.0495) – 1)x 100 = 4.059% (Ellman Calculator shows it at 4.2% (50/48=4.17) ). Note T1-1: Account Value of an account is the sum of owned Stock, Buy Back Value of current options (Negative for a short call), and the Cash balance. For the OTM trade = ($4800 (100 shares x 48) – $200 (100 x $2 Cost to Buy Back) + 5394.37 = $9994.37 (Notice if commission = 0, the account value remains the same at $10.000 and entry time). This show you do not gain any income initially. You will gain the full ROO% at Expiration Friday when the Time Value has decayed to 0). Note T1-2: At Expiration, if the price of the stock remained constant, the time value of 2 for the OTM options will decay to zero, your option is worthless. Your Account value is now $4800 + Option Value = 0) + $5394.37 = $10,194.37 (With Commission = 0, $10,200). ………………(4) RCB = 48 BEP (new) =46.0563 + 0.4495 (raises cost basis) = 46.5058 ROO% (45-BEP(new))/RCB = 1.5058 / 48 == -3.14% (Price at 45). If the price of the stock rises to 48, the Return would be (48- 46.5058) / 48 = 1.4942 / 48 == 3.11%, the Ellman calculator show 3.3% without commission. *Notice that with the stock at 45, the underlying stock is down 6.25% but your net loss in the position is only 3.14% or a difference of 3.11% improvement because of the income received. You can also check / verify this by summing the income from each trade +1.9932 – 0.4495 = 1.5437 net income or 1.5437 / 48 = 3.22% which closely agrees with the 3.1% stated above. * If the stock prices rises to 46.5058 or higher you will be at breakeven or above. * In dollars lost, the 3.14% loss at 45 represents $150.72 loss (0.314 * 48 * 100) in your total account value. If you sold the stock at 45 (option is closed), your account values would be $5349.42 (cash) + Stock 4500 = $9849.42 or $150.58 loss from your original $10,000.00. This agrees with the $150.72 loss mentioned. Step T3 – Time T3 – Hit the Double – The stock price rises back to 48 for a Hit the Double with an STO of 1.0. …………………(4) RCB = 48 BEP (new) = 46.5058 – 0.9437 = 45.5621 (lowers cost basis); ROO% (48-BEP)/RCB = (48 – 45.5621)/ 48 == 2.4379 / 48 = 5.08% or $243.79 in Profit if the price stayed at 48 at Expiration Friday. The Ellman calculator shows 5.4% without commission. Expanding on the above, if in the future the trade rolls out and up, you just add the income factors to the latest BEP calculated. This BEP method will work at any stage of your trade. If you receive a Dividend of $40.00, then just reduce the cost basis BEP by $40 / 100 or 0.40 and recalculate your ROO%. Note the effects of commission on your ROO%. The benefits of selling more than one contract reduces the effect of the commission significantly. 5 Contract would change the BEP by $5.00 / 500 or $0.01 approximately per share, instead of $0.05 with 1 contract. It is worthwhile going through similar calculations with an ITM trade where Intrinsic Value and Time Value come into play. Assume Buy BCI Covered Call with Stock price at 48 and Selling Strike 45 Call Exp 7/20 at 5.00. Intrinsic Value is therefore 3.0 (48 – 45) and the time value of this call is 2.0 (Premium – Intrinsic). Using the Ellman Calculator, the ROO% of this trade if 2/45 or 4.44%. Downside Protection: 3/48 or (1- (45/48)) == 6.25%. Your net Gain or profit for one contract is $200.00 ($2 * 100 ). You can calculate it also from the ROO%. Gain = 0.044 x 45 x 100 = 198. The Return Cost Basis (RCB) for the ITM trade is now the Strike value or (Price of Stock – Intrinsic Value) which is the reduced cost basis or price of the stock that guarantees the Time Value profit of the position, per the BCI Methodology. The Account value calculations below verifies the Intrinsic value effects on the trade is cancelled out and does not show up in the calculations for the Return profit. It does show up, however, in reducing the Breakeven point of the trade. …………………(4) RCB = 45 (The sale price at Expiration) BEP = (48.0495 – 4.9932) = 43.0563; ROO% (45-BEP)/RCB = 4.32%. This compares to the Ellman Calculator Return of 4.44% without commission. * The Total Cash of $5694.37 compares to the OTM Trade case where the Total cash was 5394.37. The $300 difference is due to the Intrinsic Value of the trade. You may receive this extra cash, but it is not adding any additional value to your account. shares x 48) – $500 (100 x $% Cost to Buy Back the ITM call) + Cash 5694.37 = $9994.37 (Notice if commission = 0, the account value remains the same at $10.000). 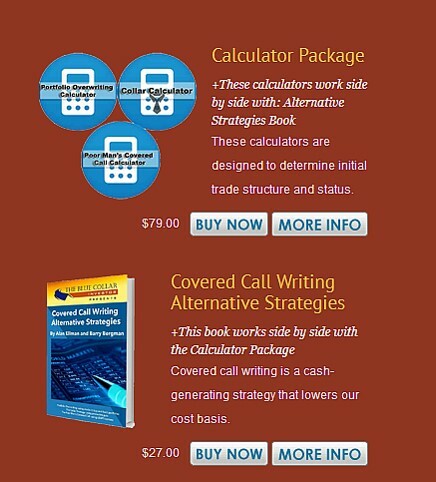 This calculation shows you that the additional cash in the account is cancelled out by the additional cost to buy back the call. The above also shows, like in the ITM trade, that you do not gain any income at entry time. You actually will gain the full ROO% of your position at Expiration Friday when the Time Value has decayed to 0. This is shown below. At Expiration, if the price of the stock is In-The-Money (above the strike price of a call, the short call has no value to the writer, and the stock is assigned or sold from your account at the Strike price. Your Account value is then: $4500 (sold stock) plus the cash of 5694.37 = 10194.37. Without commission = $10,200.00, which shows the gain or profit as $200., as mentioned above. Hope the above helps someone in understanding the return on your investments and other information. SUPN is getting hammered. It was a bold stock in this week’s report. As of Friday 6/29, the day the report was compiled, SUPN hit its’ all-time high. Late Monday morning, 7/2, the Piper Jaffray analyst had a negative note on one of SUPN’s drugs. Also, check out the article that appeared on 7/2 in IBD. This could be profit taking since SUPN has run up an 11% profit over recent weeks. Can i by cash secured puts at the money or slightly in the money, collect the premium, exercise early, get the shares assigned (hopefully in few hrs or at close) and immediately sell the assigned shares in the market for a small loss or profit depending on stock price next day or as soon as assignment? Did you mean sell a put option, collect the premium, exercise and buy the shares at the strike and then sell the shares? If so, it is important to realize that when we sell options, we are not in control of exercise, the option buyer is. Generally, options are not exercised early with the possible (and rare) exceptions of prior to ex-dividend dates. When we buy put options, we are not collecting a premium but rather paying one. These concepts are a bit tricky at first but will become second nature within a short time frame. You are off to a great start by doing your due-diligence and educating yourself before risking any of you hard-earned money. I am looking at my portfolio, and it is accumulating a 4% paper loss after the 2 weeks of market down turn. It was a little frustrating, but, on the other hand, I was able to buy back the calls of 6 positions following the BCI 20/10 guide line, most of them around 20% of the premiums. Now, as the reboubd seems to have started today, I hope to recover by the July 20 expiry cycle, or a little later, before the respective ERs are due. Well, you know me, I am never wrong about the market and I should have my own newsletter. Uh huh….right :)! I have seen too many August and September declines in OK years not to mention mid term election years with trade wars. So I will build cash during any July rally and sell ITM calls for Aug and Sept on half of the things I keep. as I write, my paper loss is down to 1.5%, and i am starting to look at selling some calls aginst the positions that have recovered best. Your opinion is always very sound and helpful. Since this market is so volatile please sell your over write calls on up days and sell your cash secured puts on down days to get the best of both. will do as you say. I wish to participate in your game, but my time is limited by my work at my company. As I told you before, the Brazilian recession has made it necessary for me to return to work there every day (half time). We had 3 years in the red, and now it is improving slowly. We had to reduce our workforce by more than 50% at enourmous expenditures required by our local labor legislation. Also, we were forced to change the profile of the business because the market has shifted substantially, and this required some serious investment. But I feel very confident and optimistic about the future, both short and long term. See you next week on the new thread.